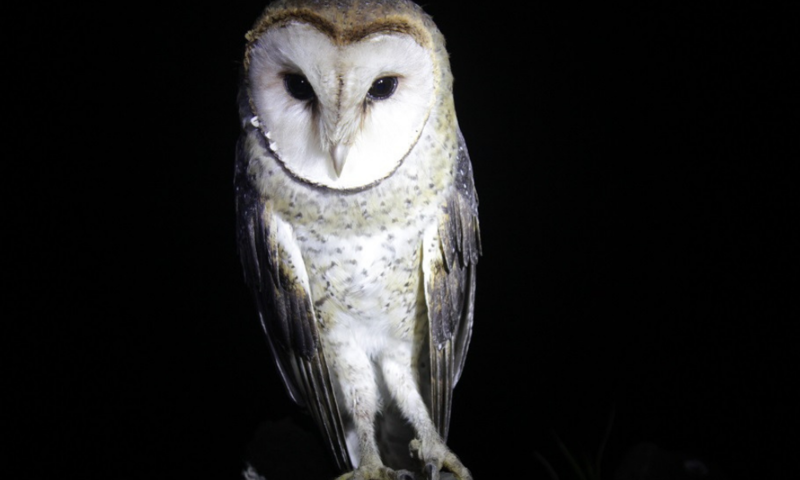 One of the world's smallest species of barn owls, this endemic bird of prey hunts at night for rats, mice and insects. 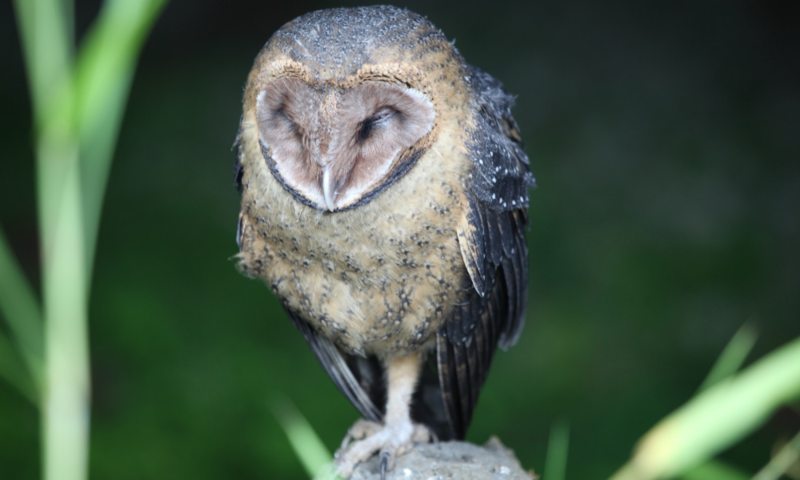 The Galapagos barn owl is one of two resident and endemic owl species in Galapagos; the other being the short-eared owl. Unlike the latter, the Galapagos barn owl is completely nocturnal, hunting primarily for rats, mice and insects at night only. As opportunistic feeders, however, they have been known to predate upon small birds and reptiles. Their nocturnal nature makes them an elusive species, rarely seen by locals or visitors. Measuring 26cm in length and with a wingspan of 68cm, like many Galapagos endemics, they are smaller in size than their mainland counterparts. Furthermore, their colouration is darker than their continental relatives, with a rusty brown back and pale/cinnamon coloured underparts speckled with light and dark spots. Their white/buff heart shaped face is very distinctive and the males and females are much alike. They are silent fliers, with moth like wing beats interrupted by long glides. They show a preference for nesting in the arid and transitional zones and do so throughout the year. However, they have also been recorded nesting in the highlands from November to May. Tending to nest in small holes, like lava tubes, volcanic cones or small tree cavities, they will also nest inside buildings. They lay on average three eggs per nest, which are incubated for roughly 30 days and the young will fledge after 10-12 weeks. Where to see them: Galapagos barn owls can be found on Fernandina, Isabela, Santiago, Santa Cruz and San Cristobal. Whilst they can be found in the highlands, they are most frequently seen in the dry and poorly vegetated lowlands. When to see them: At night or occasionally very early in the morning. Threats: Galapagos barn owls were known to be hunted on the inhabited islands, primarily in response to eating chickens, but also as an act of superstition. A 2016 study found that barn-owls, along with short-eared owls, were often victims of road kill. However, the full impact of both these issues is still unknown. 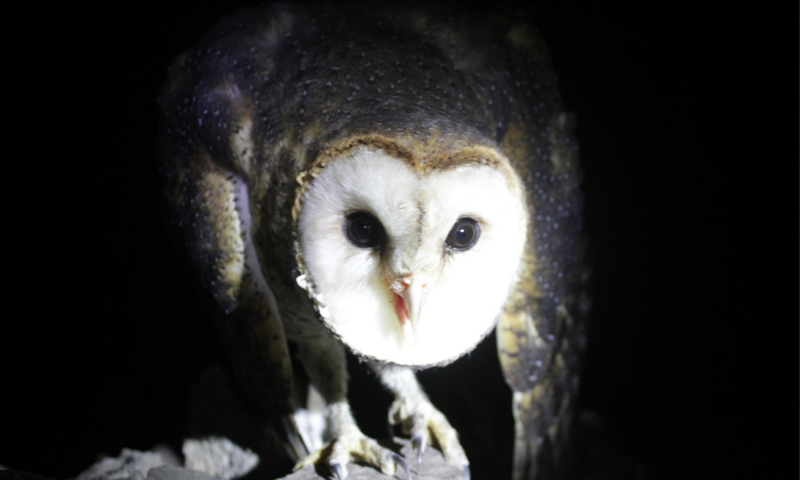 Conservation action: There are currently no projects specifically focused on the conservation of the Galapagos barn owl.